Big Yella is a historic ocean view home in Deer Isle Village. This classic home dominates the hillside and enjoys views of Northwest Harbor. The home has a central island location making it easy to head to Stonington or Sedgwick. Big Yella is a six bedroom, three and a half bathroom home. The home exudes timeless beauty with its large kitchen, formal dining room, tin ceilings, original chandeliers and beautiful hard wood floors. There are many spaces for one to relax around the first floor in the home whether it be in the den, the living room or on the patio overlooking the ocean below. The second floor of Big Yella has six bedrooms and three bathrooms. The first bedroom also known as the master bedroom is a full efficiency apartment with a kitchen and lounge area and a private queen sized bedroom with a 3/4 bathroom. The second bedroom has two twin beds each with a nightstand and a closet. The third bedroom has three twin beds, a closet and a dresser. The fourth bedroom has a queen bed with two nightstands, a closet and a dresser. The fifth bedroom has two twin beds, a closet and a dresser. The sixth bedroom has a twin bed and a dresser. The home has a spacious yard area with lush green grass and and a nice wooden patio with outdoor seating. 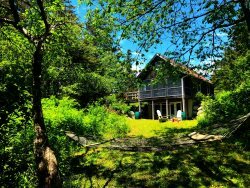 There is a path to Deer Isle’s Lily Pond in the rear of the house which has been one of the families most favorite amenities for years. Deer Isle Village is just across the way on Bridge Street where there are galleries, a novelty shop, a library and one of our great area restaurants The Whale's Rib Tavern. Big Yella is a timeless home with many great amenities. Enjoy some island time in this spacious ocean view home in Deer Isle.